Matt Hooper:"I don't have to take this abuse much longer!" 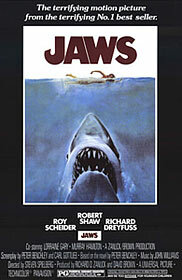 Chief Martin Brody:"You're going to need a bigger boat." Quint:"Farewell and adieu to you, fair Spanish ladies. Farewell and adieu, you ladies of Spain. For we've received orders for to sail back to Boston. And so nevermore shall we see you again." Chief Martin Brody:"I used to hate the water." Matt Hooper:"I can't imagine why." Matt Hooper:"That's it! Goodbye! I'm not going to waste my time arguing with a man who's lining up to be a hot lunch!" Quint:"Here lies the body of Mary Lee, died at the age of a hundred and three. For fifteen years she kept her virginity, not a bad record for this vicinity." Quint:"You all know me. Know how I earn a living. I'll catch this bird for you, but it ain't gonna be easy. Bad fish. Not like going down to the pond and chasing bluegills and tommycocks. This shark, swallow you whole. No shaking, no tenderizing, down you go. And we gotta do it quick, that'll bring back your tourists, put all your businesses on a paying basis. But it's not gonna be pleasant. I value my neck a lot more than three thousand bucks, chief. I'll find him for three, but I'll catch him, and kill him, for ten. But you've gotta make up your minds. If you want to stay alive, then ante up. If you want to play it cheap, be on welfare the whole winter. I don't want no volunteers, I don't want no mates, there's too many captains on this island. Ten thousand dollars for me by myself. For that you get the head, the tail, the whole damn thing." Quint:"Here's to swimming with bow-legged women."